This tiny but powerful device has already won hearts of many men and women all over the world. So what is the secret of its success? Of course it’s not about its own perfect form and design but about the effects this wonderful device can provide. 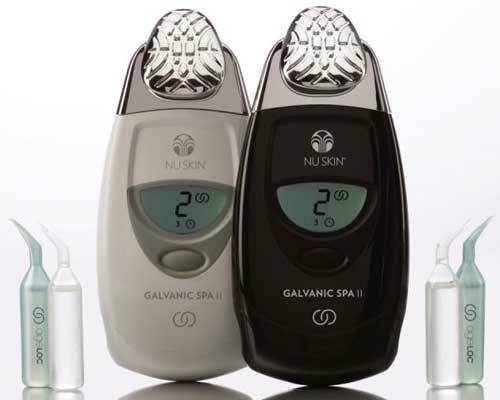 So what do you get when you invest into the Galvanic Spa™ II featured by Nu Skin? Be ready for promotion! We know about many cases when people got promoted because they got changed. And this small magician made those changes! So think well before you decide to buy IT– your life may change; are you ready for that change? Think about it! If you used to decline SPA treatment before because of lack of time or money now you have no excuses. You have no excuses to live with your tired skin and worn out body. Now you have a unique opportunity to benefit from SPA treatment in the comfort of your home. It will take you just 20 minutes three times a week and cost no more than a lunch in the cafe next door. This small, elegant, multifunctional device self adjusts to your skin type and cares about it with the help of micro currents, every day, so that in no time your colleagues will ask what has happened to you. Have you found a treasure or may be your granny from Australia has left you a fortune of a million dollars? Why are you looking so great? You will get to know a special pleasure to make other people surprised by your fresh and energetic looks. Would you dare to look like a model from a fashion magazine cover? Galvanic SPA – this is what you need! Very often our customers ask us how this device works and why its effectiveness is so high. Just have a look at these pictures and you will understand everything. You begin with applying the cleansing gel which is ionised, i.e. charged negatively. The head of the device is also negatively charged. Negative charges of the device and the gel repel each other driving the gel deep into the skin. Components of the cleansing gel bind toxins and impurities in skin thus opening its pores for further treatment. After that you apply the nourishing gel which is positively charged. The head of the device is also given a positive charge. While contacting with your skin it attains the negatively charged particles of the cleansing gel while the positively charged particles of the nourishing gel successfully penetrate even deeper into the skin. Now you know absolutely everything about the physical processes which take place while the device is in function. But this is just a part of the secret.The other part is the ingredients of our Pre Treatment and Treatment Facial Gels. The most important active ingredient of the gels is ageLOC™ – a revolutionary anti-oxidant component which helps block the reason of free radicals appearance in the epidermis and slows down the visible signs of aging. Thanks to the new formula these galvanic gels make your skin visibly younger, enhance circulation and face complexion, rejuvenate and revitalise your skin, distress and nourish it. It was clinically proven that the Galvanic SPA system enhances the effectiveness of gel active ingredients by 70 per cent. That’s why people all over the world tell about wonderful results they got while using the Galvanic SPA system. Would you like to have a reliable means to always look great? Invest into your beauty and your young looks. The turnover of this home cosmetic device Galvanic Spa is less than 3 months, and after that your will have the possibility to save a few hundred euro a month! Have you decided to be among those lucky guys who have the possibility to indulge themselves to this unique treatment? Contact us as we sell it at producer’s price. 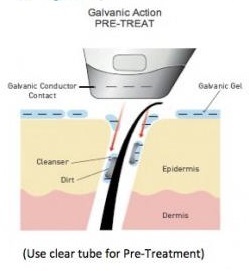 I started using the Galvanic Spa this time last year as a customer. I’m 33 years old and have struggled with rosacea my entire life. I no longer have red patchy, painful break outs. 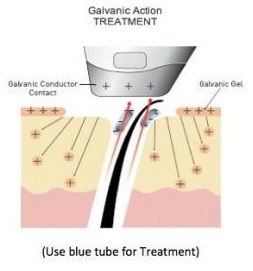 My skin feels so fresh and invigorated after using the Galvanic Spa with the AgeLOC gels. At first I started out using it three times a week to clear up my skin issues, now I use it two times per week along with the 180 Anti-Aging face wash system. I loved the products and had such great results, I became a Distributor In February of 2009! Great instrument! Small, but replacing entire beautician salon!